Dr. Melanie K. Yazzie is an Assistant Professor at UC Riverside. This the second part of our conversation, read the first here. See her full bio at the end of the interview. You've written and thought about, and worked directly on, tribal sovereignty issues. For example, you've written about Navajo water rights as an important sovereignty issue. And, recently I've read articles about the role of tribal sovereignty in dam re-licensing, about tribes upholding the Paris climate treaty, and you've also done work related to the Muslim ban, creating the hashtag #nobanonstolenland. It feels like a time that is full of both tension and possibility in terms of what exercising tribal sovereignty might look like in 2017. Yes, these are all incredibly relevant issues. I think we're living through a paradigm shift right now, and we're actively shaping it, whether through intellectual or activist work, or having conversations like this. And I, like everybody else, don't know what's going to happen. I can only help try to shift it. It's a very tense and tumultuous time, but also a time of opportunity for us to engage in forms of relationality that aren't premised on the status quo. We're seeing grassroots movements of a kind and scale that we haven't seen in quite some time in U.S. And, water seems to be at the center of a lot movements right now. It's all very messy. I think at a time when American sovereignty and nationalism are in a kind of crisis, tribal sovereignty – the sovereignty of the first peoples of this land that were here long before the United States ever existed – gives us an opportunity to rethink our values and practices of nationalism and nationhood. It's also scary as all get out – we could meet our end soon collectively. Or, we can keep struggling and find ways to work together based on values where we don't exploit and dehumanize each other. It's going to be a long time before we understand what that looks like, but we just have to keep doing it. Basic survival and basic democracy, those things are not certain right now. Even though those seem like basic requests, we're having to fight for them. And, indigenous people are absolutely at the center of that struggle. We are the people that have the first relationship with these lands, we know these lands, we understand them. We also have political and legal orders that can help guide us in a different direction. I hope that all the other people that call this land home now see that and understand it, because without us, I just don't think it's possible to do what we need to do in order to survive and ensure a future for everybody in these lands. You describe yourself as both a scholar and activist. You use the phrase “organic intellectual work” to describe the richness of thought and practice that happens outside of academia and reference a video showing activists in Window Rock, Arizona confronting Senator John McCain about a water deal to illustrate the point. How do you interweave activism with your scholarship? Pretty much everything that's been written in discipline of history about my people, Navajo people, has only ever talked about politics from the perspective of formal tribal governance and leadership. But, what people think of as social or grassroots movements have profoundly shaped political history. When we think of politics, we always have to be thinking: what are the people doing? What is the discourse coming out of people's movements? And, even if they don't become full-blown political resistance movements, we still have to pay attention to what's being written and said by people on the ground. This is where that organic intellectual concept comes up. On a broad level, it describes people who engage in struggles against their oppressors, however they define the system or the group who are oppressing them. It's from the struggle itself that knowledge is produced. And there's been a lot of organic intellectual work by Navajo people who don't have formal educations but have produced some of the most incredible history and analysis of Navajo politics that I have ever seen. For example, I look to John Redhouse who had a bachelor's degree from the University of New Mexico. He donated his papers to the library there. He wrote a lot of op-eds and unpublished essays during the 70s and 80s when he was engaged in militant activism against resource extraction and racism toward native people in reservation border towns. I also draw from the women, the Matriarch Resistors of Big Mountain, that were part of the Peabody Coal struggle. Throughout the 70s, 80s, and 90s most of the struggle against coal was centered on Black Mesa and Big Mountain where these elderly Diné women were resisting being relocated to make way for coal mining operations. At the time, they organized around religious freedom, but if you read the oral histories and testimonies that these women give as they traveled around and did newspaper interviews, they provide a profound and fascinating critique of capitalism and colonialism and biopolitics, even though they don't use any of those terms. And, I build a lot on the work of activists and other people I know who are doing this work right now in 2017 in the Navajo Nation. There tends to be an obsession with corruption in politics; it's a normative conception of politics where everything is about personalities and shortcomings and scandals, kind of like the show Scandal. Even scholarly historians have decided we should narrate the history of Navajo politics through that lens of personality. I'm not interested in that definition of politics because I think it conceals the actual power dynamics and relationships that are unfolding and that define politics. It's about the people. 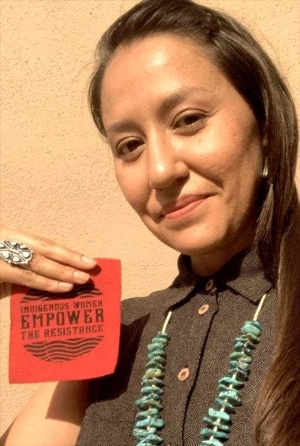 Melanie K. Yazzie is a Diné feminist with an unwavering commitment to defending and liberating Native people from the violence of colonialism. She is a tenure-track Assistant Professor in the Department of Gender and Sexuality Studies at UC Riverside. She holds a Ph.D. in American Studies from the University of New Mexico. She specializes in Diné studies, Indigenous feminist and queer studies, American Indian history, social and political theory, critical environmental studies, and US social movements. She has held numerous research fellowships and awards, including a UC President's Postdoctoral Fellowship, an Andrew W. Mellon Dissertation Fellowship, and a Ford Foundation Diversity Predoctoral Fellowship. She is a past board member of Navajo Studies Conference, Inc., a non-profit dedicated to the development of Navajo Studies, and an organizer with The Red Nation, an activist coalition advocating the liberation of Native people from colonialism and capitalism. She has published articles and book reviews in Wicazo Sa Review, Studies in American Indian Literature, American Indian Quarterly, Social Text, and American Quarterly. With Nick Estes, she recently guest edited a special issue of Wicazo Sa Review (June 2016) on the legacy of Dakota scholar Elizabeth Cook-Lynn to the field of Native studies. She is also co-editing a special issue of Decolonization: Indigeneity, Education, and Society with Dr. Cutcha Risling-Baldy on North American Indigenous water politics. Her first book project is based on her dissertation. It offers a critical feminist and materialist history of postwar Navajo political formations.